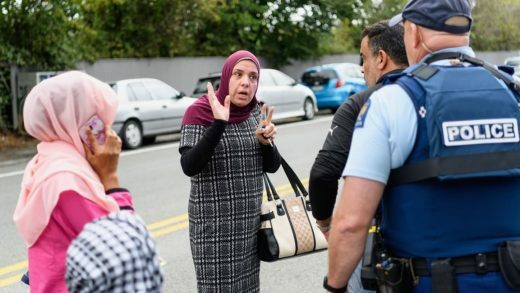 Police in New Zealand said that 49 people had been killed and 20 were seriously injured after a gunman opened fire on two mosques in the city of Christchurch. Authorities said that a man had been charged with murder and would appear in court tomorrow. Two other men and one woman were in custody, police said, and two explosive devices had been recovered. The shootings occurred during Friday prayers, when hundreds of worshipers were in the mosques. Many of the dead were immigrants, police said. A still from the shooter’s Facebook Live video. The gunman, who has been identified as 28-year-old Brenton Tarrant, live-streamed the shooting in an 17-minute Facebook Live video, which he began by telling viewers to “subscribe to PewDiePie,” the YouTube mega-star. He also posted a white-supremacist manifesto on the 8chan forums before the shooting, with a link to his Facebook page. “Please do your part by spreading my message, making memes and shitposting as you usually do,” part of his post reads. The manifesto is bait. It is loaded with keywords that lead down far-right rabbit holes. Do not repost. Quarantine is our best defense against spreading their message. In Twitter posts dated March 12, the gunman also posted photos of guns and body armor, with names of historic military generals and mass shooters scrawled on the weapons. Police said they were doing everything they could to remove the video from social media, the New Zealand Herald reported. “It shouldn’t be in the public domain,” said Police Commissioner Mike Bush. The 17-minute video, filmed on a GoPro head-mounted camera, begins in the gunman’s car, as he drives to the Al Noor Mosque. He spends two minutes inside shooting at worshipers, runs back to his vehicle to swap weapons, then re-enters the mosque and resumes shooting. After a few minutes, he returns to his car and speeds away. In an apparent online post by the suspected shooter, he identifies himself as a supporter of Donald Trump, describes his possible motives, his choice of New Zealand as a target, and his aim to impact the political climate in the United States. As the New York Times noted, New Zealand had 1.2 million registered guns in 2017, among a total population of 4.6 million people. But the country hasn’t seen a mass shooting since 1990, when a man killed 13 people in the town of Aramoana. A set of stringent gun laws followed, including restrictions on military-style semiautomatic weapons. Across the country, gun homicides have remained in the single digits annually except for 2009, when there were 11 gun deaths.